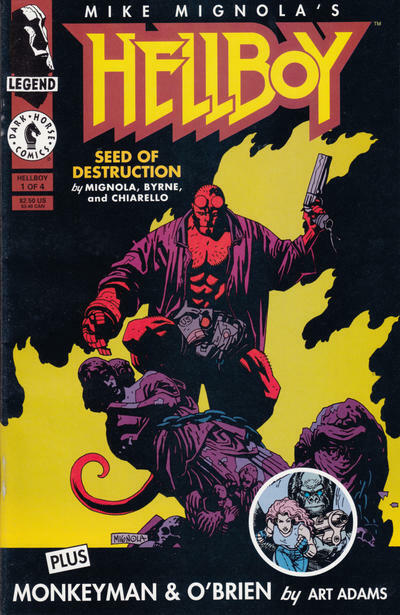 Chase is paying a visit to San Antonio this week, so Blake joins up with the back-up geeks, Mike and Kenny to talk about the career of Mike Mignola and his most famous creation, Hellboy. The guys talk about their favorite Mignola comics, their favorite Hellboy stories, how they felt about the first movie, what they’re expecting from the second, and Kenny even gives his thoughts on the new Hellboy: Science of Evil video game! In the picks, Mike likes the current Batman Confidential run, and Blake is caught by Billy Batson and the Magic of Shazam! This entry was posted in Showcase Podcast and tagged Batman, Batman Confidential, Billy Batson and the Magic of Shazam!, Hellboy, Hellboy 2: The Golden Army, Hellboy: Science of Evil, Mike Mignola, Shazam, Superman. Bookmark the permalink.